Since the enactment of California’s SB277, which prevents parents from using religious or personal beliefs to excuse their children from vaccinations, has lead to much higher vaccine uptake rates in California schools. The law still allows medical exemptions, which are medically-related reasons for not vaccinating, such as allergies to ingredients in the vaccine. Unfortunately, this had led to medical exemption abuse in many schools in California. Conflicts of interest in research is one of the fundamental tropes of people who seek to diminish the value of biomedical research, even if the research is peer-reviewed and is published in a highly respected journal. The vaccine deniers try to dismiss all medical research that has even the appearance of conflict of interest. From my point of view – yes, we should examine research with a conflict of interest, especially in medical research, more carefully. But, as I’ve said a hundred times, it’s not one article that matters, it’s the body of work. Science is based on evidence that is analyzed, critiqued and, most importantly, repeated – repeatedly. In the world of vaccines (including that annoying and loud anti-vaccine fringe group), one of the recurrent themes is that immunizations cause autism, and any research that disputes that belief is biased and/or supported by Big Pharma. That is the definition of conflicts of interest in research – this is repeated so often, sometimes I believe it. If you have been following the news, or even this blog, you probably are aware of SB 277, a bill sailing through the California legislature which, upon enactment, will essentially eliminate the California vaccine personal belief exemptions (PBE) to vaccinations of children entering in public schools or day care centers. 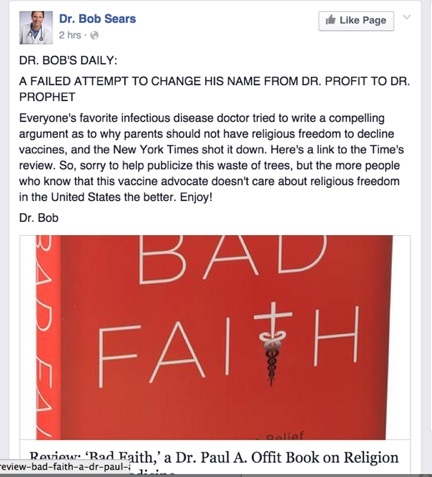 One of the favorite tools of the vaccine deniers is a personal belief exemption that allows them to essentially refuse to vaccinate one’s child based something other than a valid medical contraindication to vaccinate a particular child. These exemptions, at least in California, can be for almost anything, including the nonsense “religious exemption.” Ironically, it’s difficult to find a real mainstream or even non-mainstream religion that is opposed to vaccinations. Court case after court case has supported vaccination of children and has generally rejected many attempts at using religious exemptions to refuse vaccinations. So California, which has experienced some measles outbreaks because of unvaccinated children, has decided to get tougher on vaccinating their children, and eliminate California.